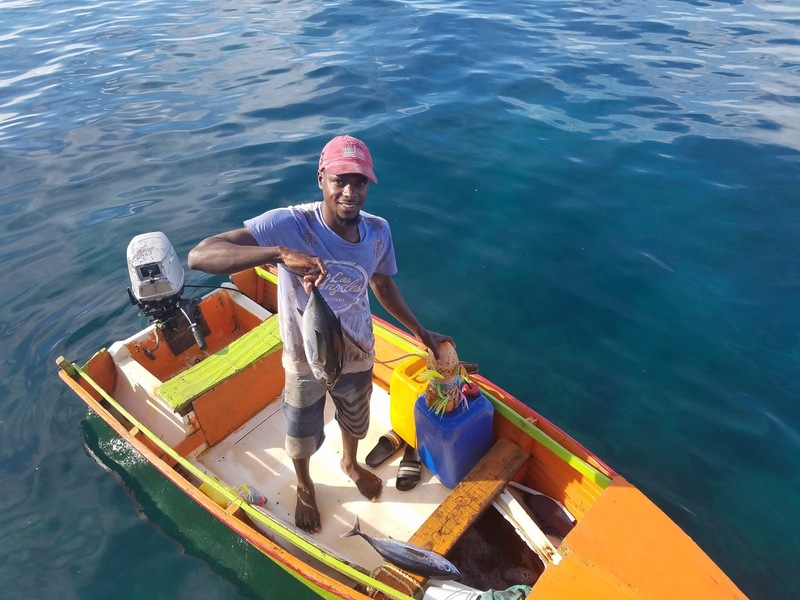 In Grenada, early morning fishermen will often stop by your boat, selling their fresh catch. To this just-caught tuna (which cost around $8 USD and fed our family for two days) we said, YES, PLEASE! Prepping for their oral book reports. 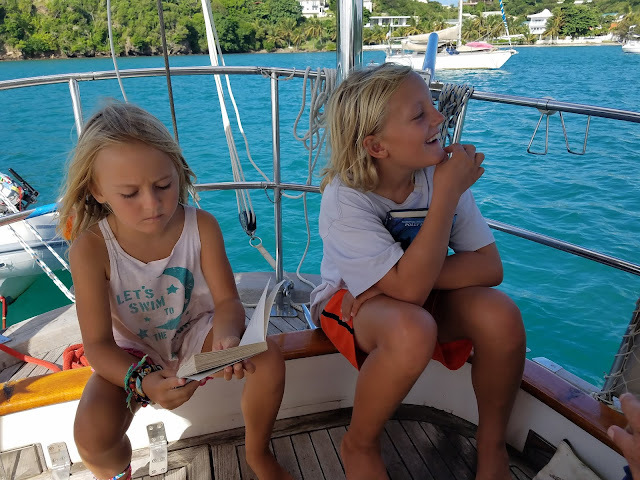 Reports and project presentations are a big deal on our boat, and both kids take it seriously. 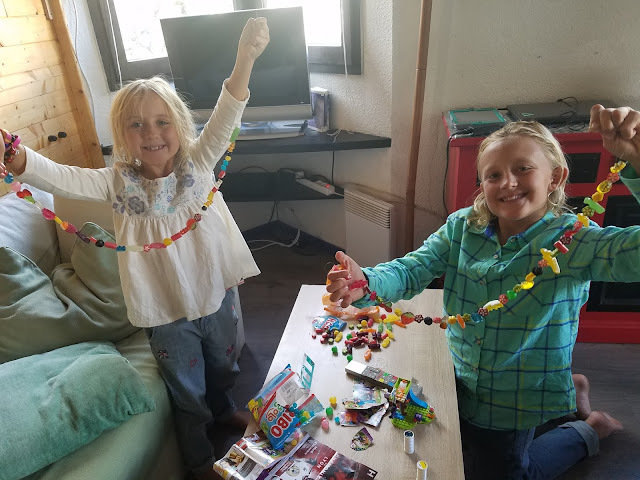 This is our 3rd year homeschooling Hudson (11 year old, 6th grade) and Vivian (8 years old, 3rd grade). 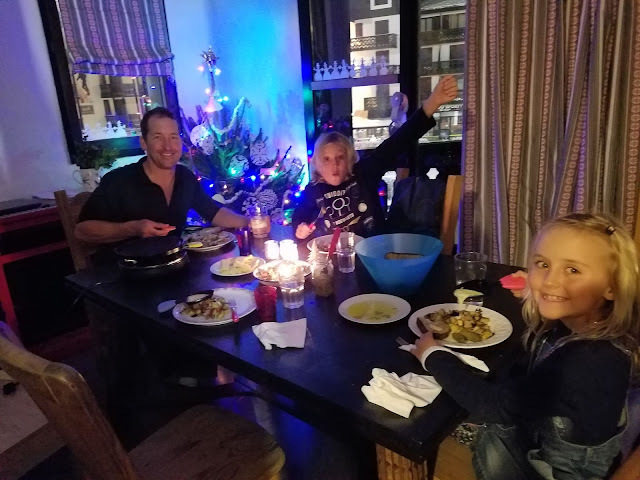 We were stoked beyond stoke when our dear friends, Aaron and Carisa Franck from Telluride, CO came to visit us in Grenada. Here's Carisa at the helm! She is a natural sailor. We are a surf loving family. Lucky for us there was a decent break near where we often anchored in Grenada. Hud will surf for hours on end. This was from our last surf session before heading to colder climates. How else do you think we fund our travels? 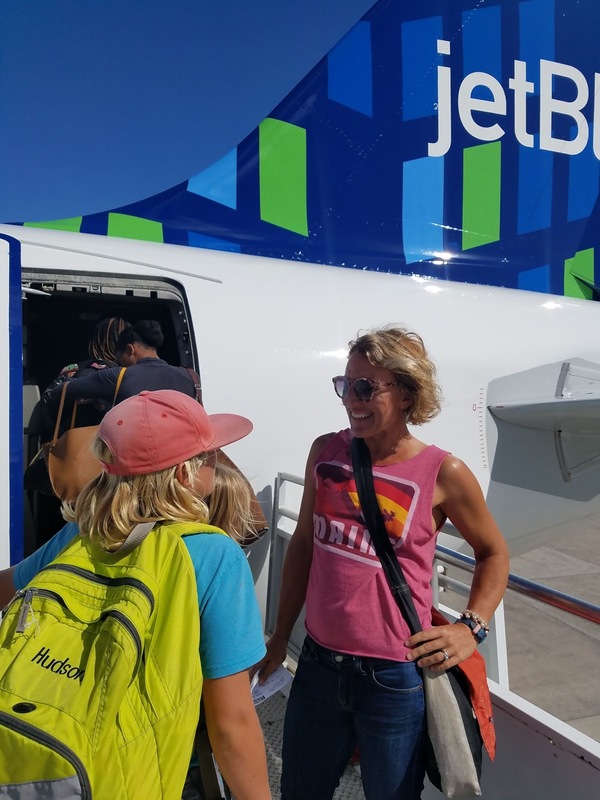 There is something about boarding a plane from stairs on the tarmac and you can see it on Jen's face. Its' a little thing, but those little differences can sometimes make all the difference. Like wearing pants for the first time in over a year. 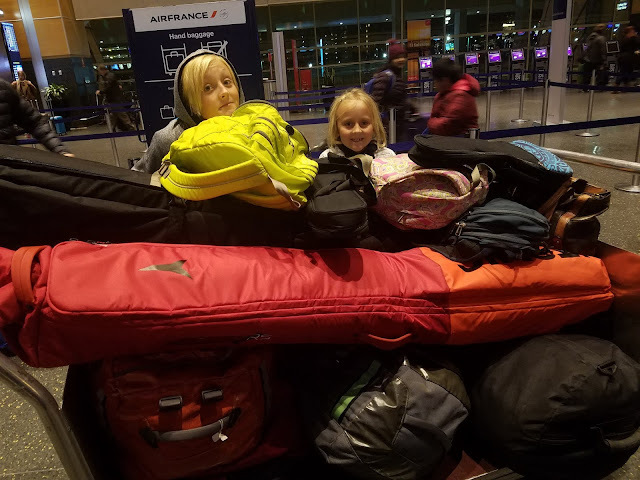 We headed to Maine for a few days, to see our families and to gather up more pants (and other necessary items for mountain life, such as skis) before heading to Chamonix, France. Sailboat living in the Caribbean is pretty light. Mountain winter living is not light. Here we are at Boston airport with 4 enormous duffel bags, 2 fully loaded ski bags, 3 backpacks, and 2 ukeleles. This was more luggage than we have EVER traveled with. We made it to France! 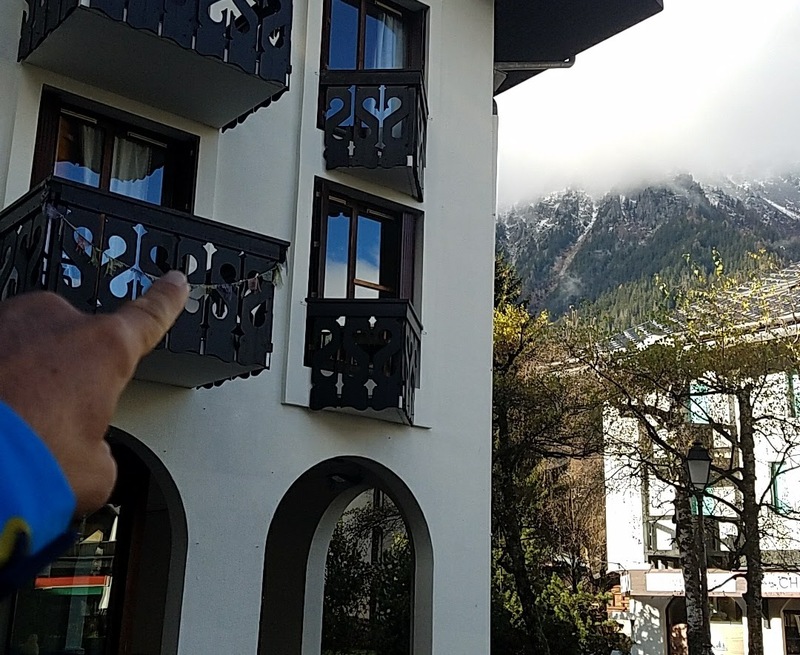 Trav is pointing to the windows of our second floor apartment in Chamonix. This was taken our first week here, and there still wasn't snow on the ground here in town. It's been snowing almost daily since then and we're currently living in a snowglobe. Stringing Haribo gummi candy for our first real Christmas tree in three years! After celebrating holidays in the zesty climates of Florida and the Caribbean, it feels really good to be celebrating Christmas in a much chillier place. Shellfish on ice outside the lovely restaurant Josephine, downtown Chamonix. 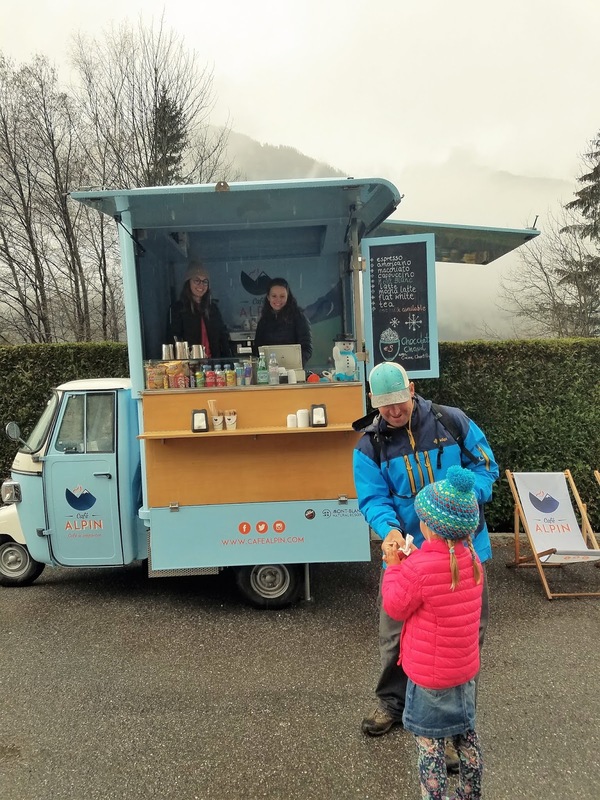 Enjoying a 5 star chocolate chaud from the cutest little beverage truck in the valley. The impossibly beautiful French desserts do not disappoint. 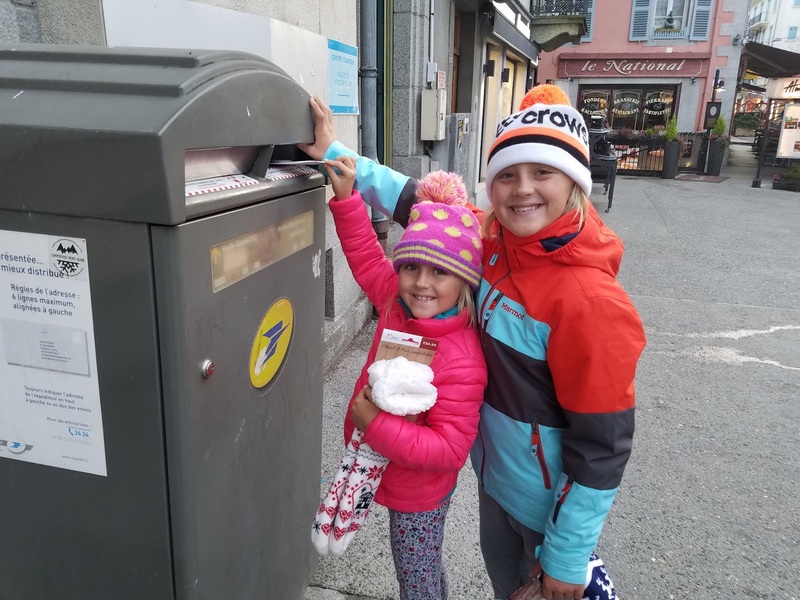 Mailing letters to Santa! In their hands they've got the stockings they bought to hang. 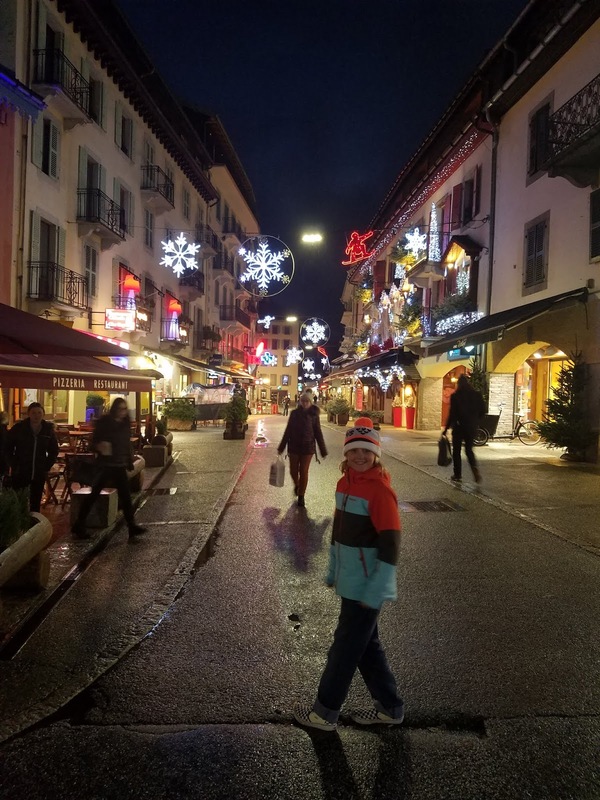 Later on we did some cultural research and learned that in France, Pere Noel leaves gifts in children's shoes, not their stockings. We'll cover our bases and leave out both footwear options. Better safe than sorry. 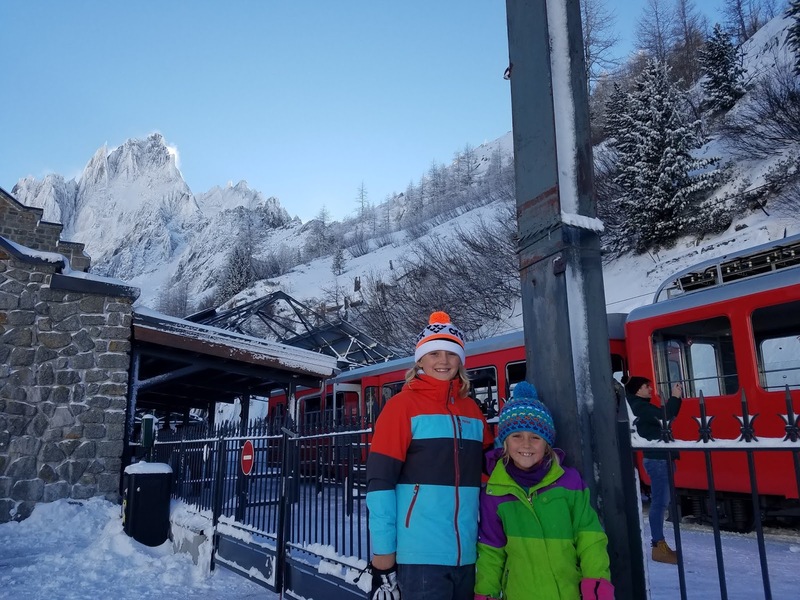 The ski areas in Chamonix didn't open until December 15, so we took a bus over to Courmayer, Italy to ski their incredible mountain for a day. 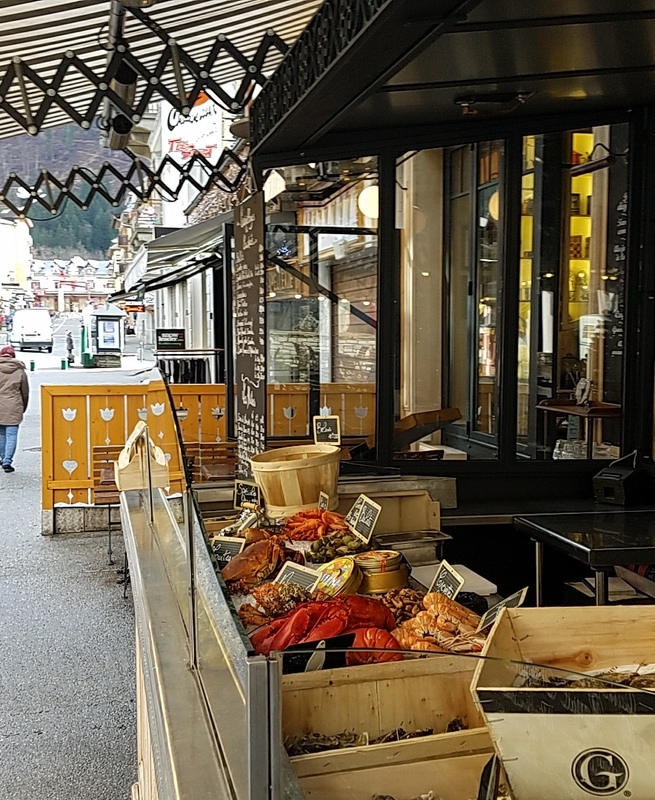 Here's one of the best things about living in Europe: Just a 45 minute drive through a mountain tunnel and you pop out in a new country, where everything is completely different. Even though it's a short distance away, the moment we arrived in Italy, the differences were vast. The language (obviously), the architecture, the general feeling. And...the food. Oh my God. We ate lunch on the mountain at this gorgeous old chalet (pictured above), just loaded with ski nostalgia and charm. 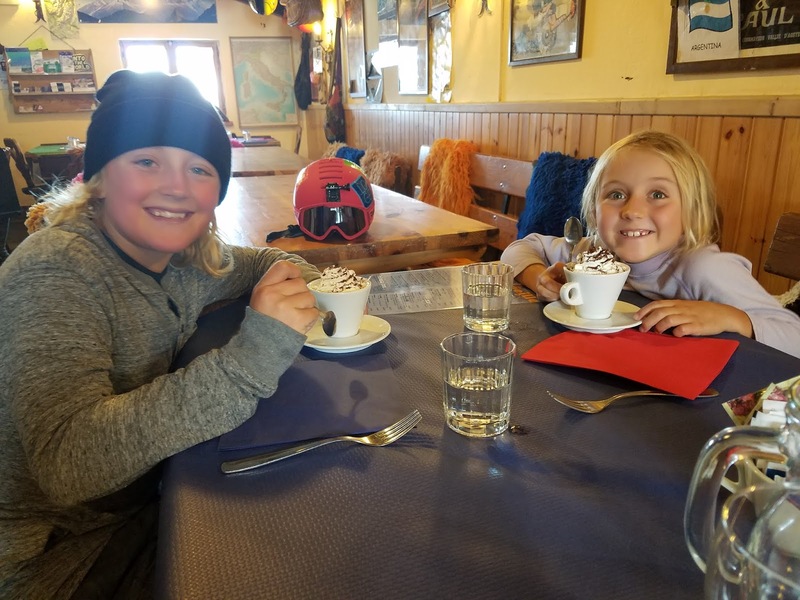 Hud and Viv swear it was the best hot chocolate they've ever had. It was so thick you could literally eat it with a spoon. 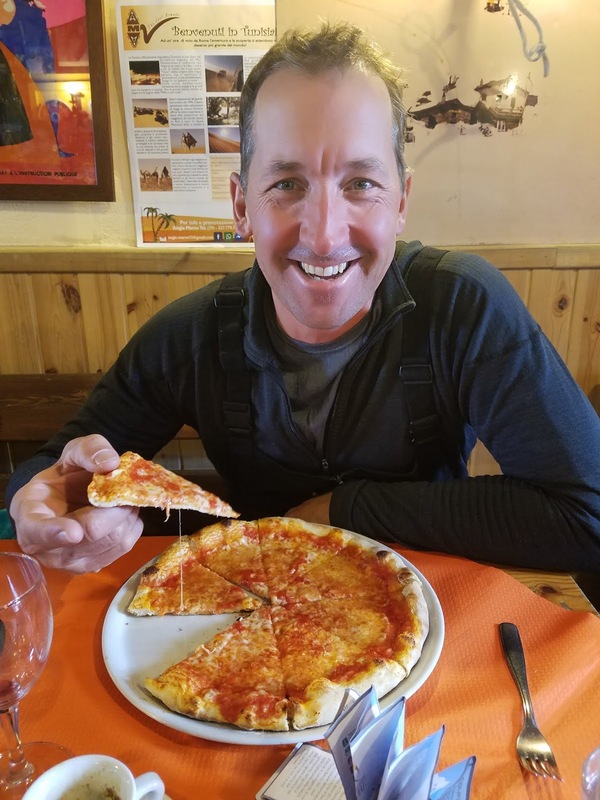 I don't care what anyone says...you can't beat the pizza in Italy. You just can't. It's the best pizza. End of story. Cheering on the Chamonix Pioneers hockey team and giving a thumbs down to the visiting team from Lyon. 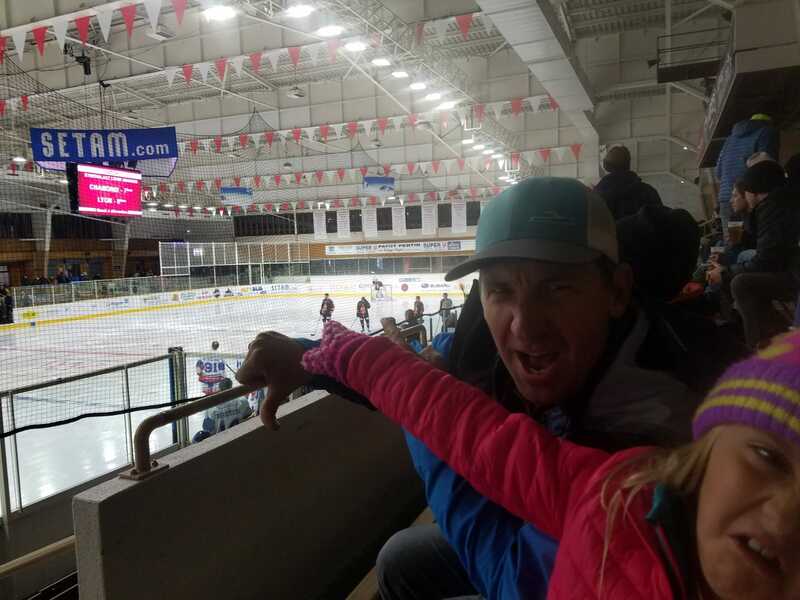 The Moxie cheering definitely made a difference because Chamonix won, 3-2. 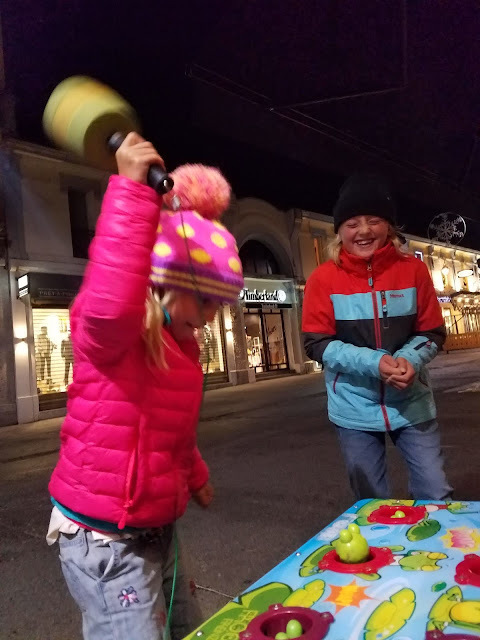 Viv plays "Whack a Doodle" (that's what she calls it) with tremendous determination and vigor, which totally cracks up her brother. 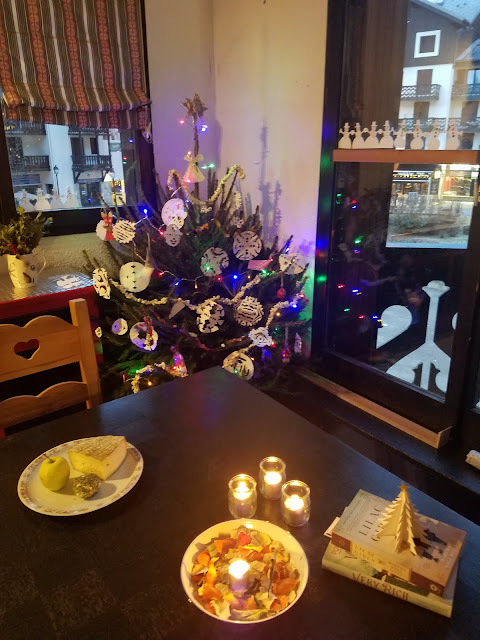 We are on a budget and we don't eat out very often. So when we do, it's a real treat. 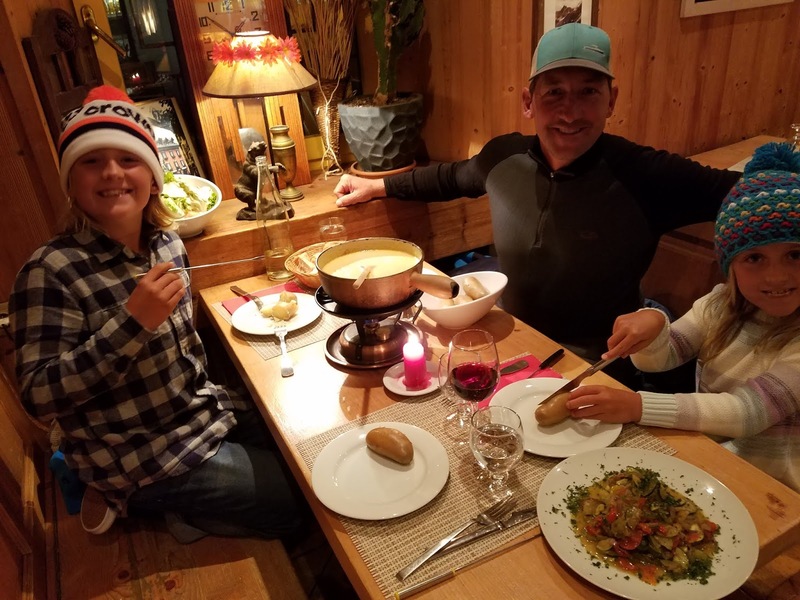 This particular dinner at Le National in Chamonix was an EPIC TREAT, because fondue is our absolute favorite. It was served with a huge salad, potatoes, sauteed vegetables, and of course, bread. The waiter questioned us when we ordered Fondue for four people as it is an enormous amount of cheese, don't worry we ate it all. 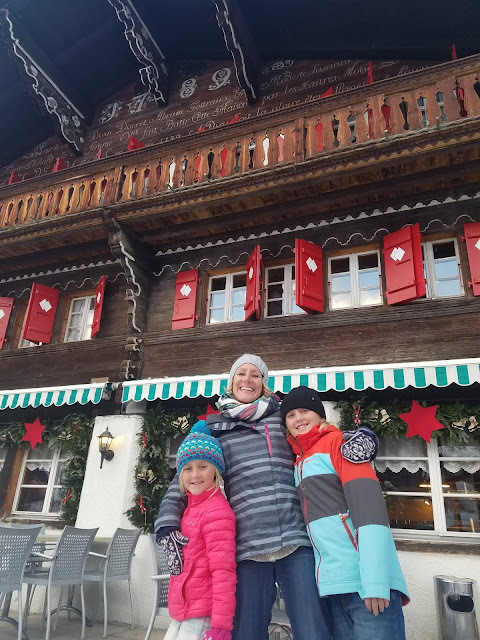 Switzerland is just a short drive over the mountain, so we rented a car for a couple of days to go exploring and to ski. 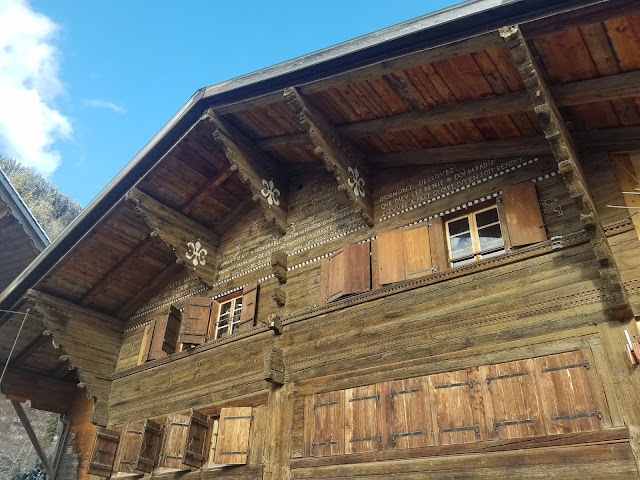 Here we are in Les Diablerets, Switzerland (and yes, that says 1789 the year it was built). The architecture in Switzerland blew us away. Clearly, history is important to the Swiss. Historic, beautifully preserved chalets are everywhere, and most of them describe the details of their origin in beautifully painted lettering, high up near the rafters. This particular one in Le Sepay was built in 1636,. This is the village where Trav visited 25 years ago for a ski trip with his good friend Chris, whose family lives here still. Fresh from the farmer's market! Check out the size of that cheese hunk! The food here is incredible. And amazingly, pretty affordable, especially compared to the Caribbean. Pretty Chamonix, all decked out for the holidays. 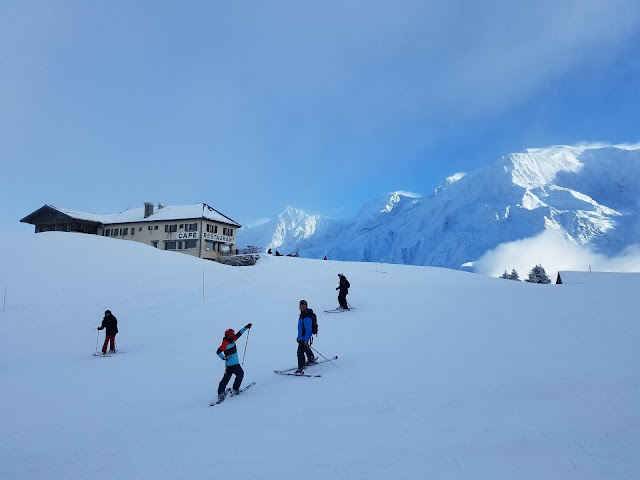 In the background is one of the many charming restaurants that line the ski slopes in the alps. And yes, that is Mont Blanc, the apparent maker of the pens and the mountain that makes all other mountains in Europe feel inadequate. So, it seems that we are gunning for the most infrequent blog poster award, and friends, things are looking good! 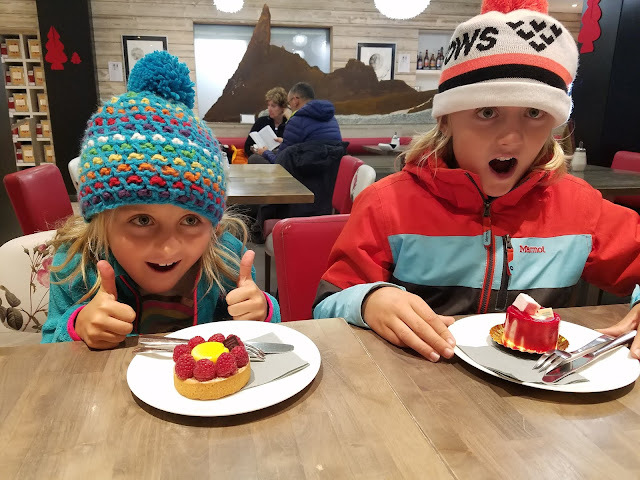 Since our last blog post, we've embarked on a new leg of our traveling adventure, a winter ski season in the French Alps. This trip has been a dream of ours for a long time. 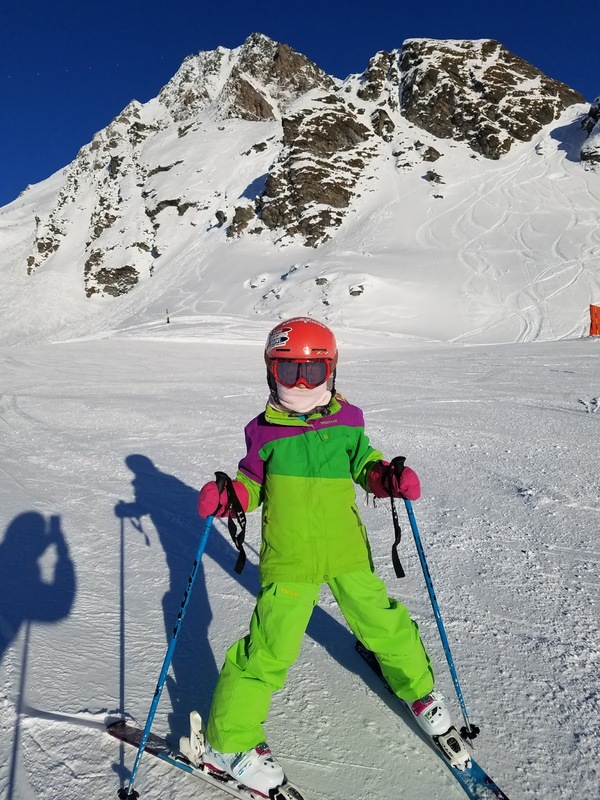 Skiing is a huge part of our family culture (we own a home in Telluride, Colorado and lived there for 17 years before leaving to sail. Our kids have skied since they could barely walk), and although we love sailing in the islands, after two years in tropical climates we felt we were all due for a dose of winter. 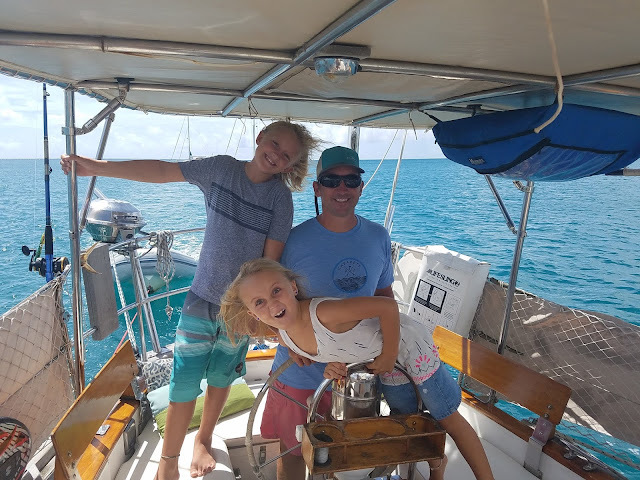 The upside of being stuck in Grenada was that we were able to spend lots of time with a some of our very favorite sailing friends, surf a lot and explore a truly fabulous island. Grenada is a natural gathering spot for cruisers. It lies at the end of the Caribbean chain and makes an easy stopping point. It also lies south of what the insurance companies call the Hurricane Box. So during hurricane season there is a huge cruising community that hunkers down in Grenada. It was fun, but on Moxie we've noticed that we start to go stir crazy when we stay in any one place for too long. Travel Lesson #2: Give Yourself Enough Time To Do Things. Booking ourselves for just two and half days in Maine on our way to Chamonix was just plain ridiculous. It was way too short of a time, especially since almost all of our family members live there or near there. From the moment we arrived in Maine until the time we flew out of Boston some 60 hours later, we were a whirlwind of activity. Packing, buying things we needed for France, and visiting with family in that short amount of time was pretty overwhelming. Travel lesson #3: Cold Weather is A Good Thing We flew to France from Boston at 7:30 pm with six loaded bags on an Air France flight and arrived in Geneva at 11:15 am the following day. As we left the airport and boarded a shuttle to Chamonix, our faces felt the first fierce slap of crisp mountain air. It was an incredible feeling. We all immediately remembered something important about ourselves: we love mountains, and we really love the cold. The switch of seasons has been a welcome change. Winter weather energizes you and we feel revitalized being here. 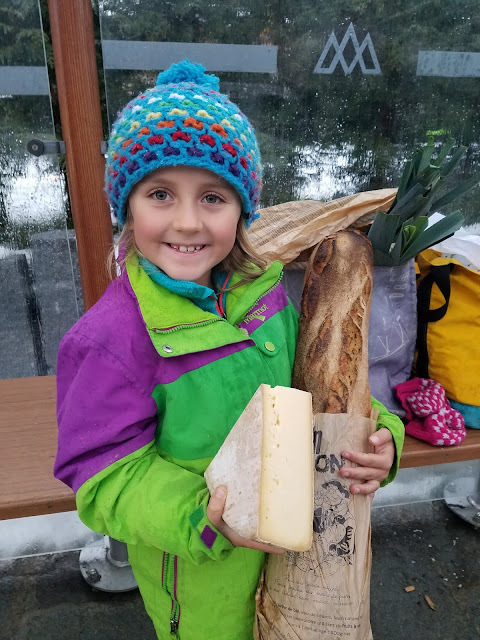 The wild beauty of Chamonix and the complete turn-around from the way we've been living has been refreshing and fun. Our brains feel awake, recharged, and re-set. Travel lesson #4: Air France is Our Favorite Airline We are huge fans of the classic, old-school airline, Air France. Remember when you were a kid and airlines served meals? Air France still does. They feed you two meals, fly you 3,700 miles across an ocean, give you pillows and headphones and sleep masks and blankets, all for $440. And here's the best part... when they misplace four of your bags for a couple of days, Air France will give you $600 to buy new stuff. That's right! Four of our bags took two days to get here, and so we got to go on a big 'ole shopping spree in Chamonix. Trav got a new jacket, Jen got boots, the kids got fleeces and hats and other essentials, and we all got a pair of slippers. It was a pretty great exchange for a small bit of inconvenience. Travel Lesson #5: Don't Make Plans, Stay Flexible, and Maintain a Stellar Attitude, No Matter What Just as we began settling into a happy little ski routine, Hudson fell on the last run of the day at Grand Montets, twisted his leg and sprained his MCL. Thankfully, his injury is not severe, and all this means is that we're taking it a little slower for the next few weeks until he heals.